Find out our exclusive catalogue of leather trays for chain watches and enjoy choosing the one which best fits to your collection. All our items are designed and handmade by leather artisans with more than 30 years of experience and they offer all kind of possibilities for customising according to the customer's will. 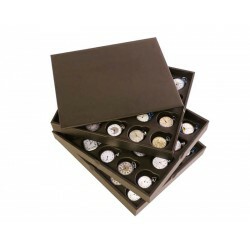 The trays for chain watches by Absolute Breton stand out because they are made with luxury leather, genuine leather from Ubrique carefully selected and manufactured following the most traditional leather techniques. Bespoke artisanal jewels handmade for the most exclusive chain watches.